One of my earliest photographic lessons was that clicking a picture of a beautiful subject, no matter how beautiful, does not ensure a beautiful result. A vivid sunset can indeed be quite pleasing to the eye, but picture of that sunset riddled with rooftops and telephone poles—well…, not so much. This got me thinking more about the individual components of a beautiful scene, and how I might best emphasize them and eliminate distractions. Like most landscape photographers, I started with the low hanging fruit, concentrating on sunrises and sunsets in beautiful locations, but it wasn’t long before I realized that I wasn’t the only person doing this. Of course I haven’t stopped targeting this obvious beauty, but I also started looking for ways to capture nature’s more subtle beauty. A Yosemite sunset, where everything in the scene is at infinity and stationary, can be captured on today’s cameras in full automatic mode. But framing, focusing, and freezing/blurring more intimate subjects requires complete mastery of motion, depth, and light. This mastery requires a clear understanding of the exposure variables: shutter speed, f-stop, and ISO. Fortunately, I had the advantage of cutting my photographic teeth back before cameras could control every aspect of exposure and focus, and with no ability to check my decision until the pictures returned from the lab, the wrong exposure choices wasted precious dollars—a great motivator. 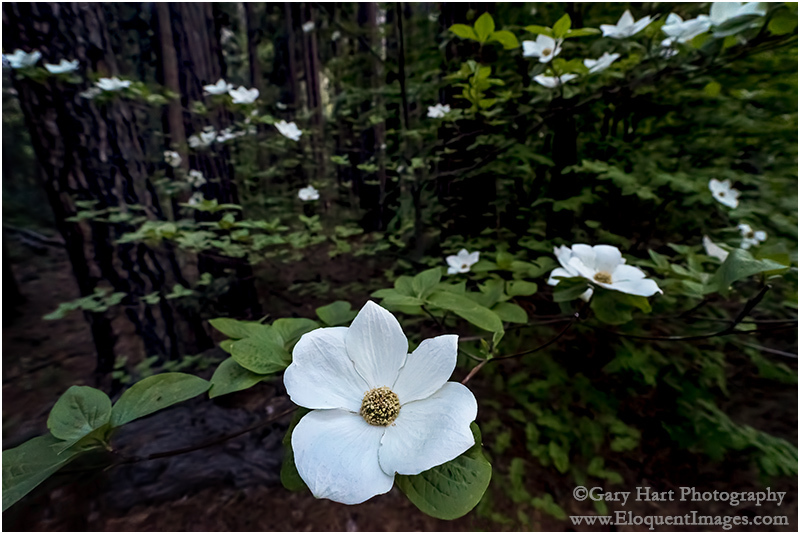 One of the first intimate subjects I turned my camera toward was the dogwood that decorate Yosemite Valley each spring. Even though I was pretty comfortable with my camera’s exposure variables, it still took a little effort to figure out how to blend these technical skills with the composition side of the craft. The key for me was consciously identifying the qualities of my subject that draws my eye. For example, with dogwood, it’s the symmetrical flowers, the flowers’ candelabra-like spacing, the tree’s translucent petals and leaves, and (especially) the illusion of weightlessness of a suspended dogwood bloom. Armed with that understanding and my exposure skills, I developed a toolbox of techniques for highlighting these features. 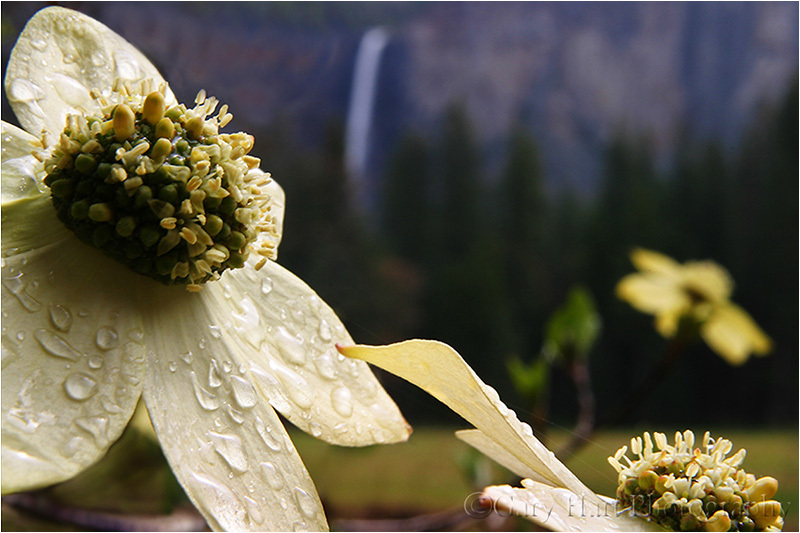 Whether it was a close composition with a narrow depth of field against a soft forest background, a swaying dogwood branch suspended above flowing water, or a single bloom with a blurred Yosemite icon in the background, I was having a blast. And it was easy to these techniques to many subjects, from colorful leaves in autumn, to brilliant poppies each spring. The dogwood in Yosemite Valley were at peak bloom, but I was dealing with the dynamic range problems inherent to a sunny spring afternoon. Photographers are frequently admonished to “Never blow the highlights,” but I saw an opportunity to use the bright sky to my advantage. Finding a shaded branch with three perfect dogwood flowers high overhead, I moved around until the branch was directly above and against the blue sky. Spot-metering on one of the flowers, I knew that everything my eye saw as blue, my camera would turn a hopelessly overexposed white that becomes a perfect background for these beautiful flowers. 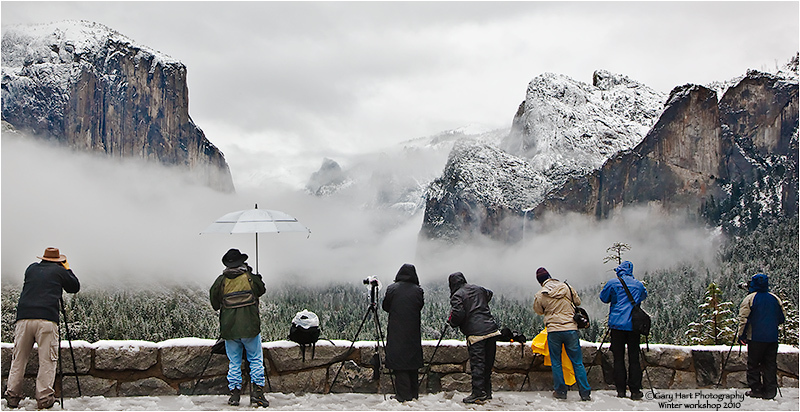 People ask all the time for my favorite season in Yosemite, and I really can’t give them an answer that doesn’t sound like a press conference by a waffling politician—there are things I love about each season in Yosemite, so asking me to choose is like asking me to pick a favorite child. But I can tell you what I like about each season, and I’ve always felt that spring in Yosemite is the most consistently photographable—it doesn’t really matter what the conditions are, I can always find something to photograph. Spring is when Yosemite’s waterfalls peak, and Yosemite Valley starts to green up. 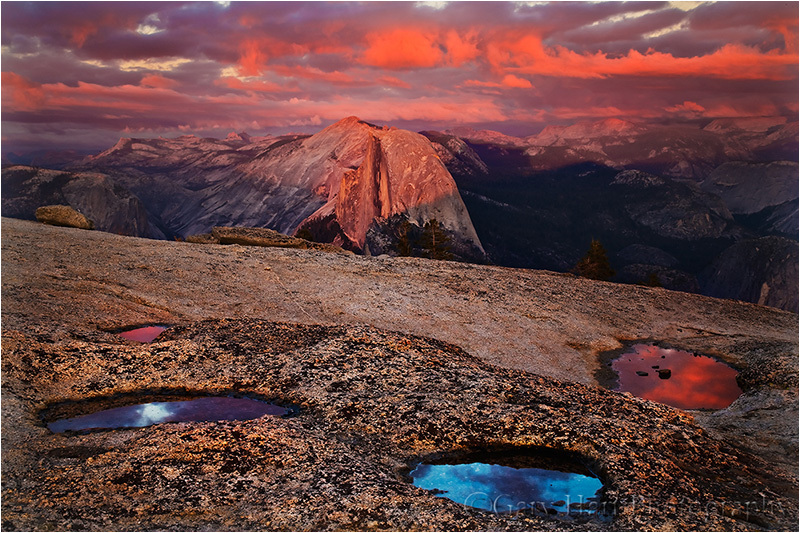 Many of the meadows are home to ephemeral pools that reflect Yosemite’s iconic monoliths, soaring cliffs, and plunging waterfalls. And with all the water in the falls, spring sunshine means rainbow opportunities from many spots if you know when to be there. Maybe my favorite Yosemite spring treat is dogwood, which usually peaks around May 1, give or take a week or two. I enjoy photographing dogwood in any kind of light, from sunshine, to overcast, to full shade. In sunshine, I put backlit blooms against a dark background, expose for the flower, and go to town. The translucence of these backlit flowers gives them a luminosity that appears to originate from within. In overcast and shade, I opt for soft focus that emphasizes my primary subject and reduces the background to colors, lines, and shapes. Regardless of the light, I start with a bloom, group of blooms, or entire branch, that I can isolate from surrounding distractions. Once I identify a likely candidate, I maneuver myself until I can get the subject against a complementary background, such as shade, shape, and color. I worked this scene for about a half hour before I was satisfied. I started with the flower-laden branch and moved around a bit until the background was right. Then I tried a variety of focal lengths to simplify, balance, and soften the composition. Once I was satisfied with my composition, I used live-view to focus toward the front of the center cluster. Finally, I ran the entire range of f-stops from f4 to f16, in one-stop increments, to ensure a variety of bokeh effects to choose from. Can you defend your exposure settings? Aperture, measured in f-stops, is the size of the opening that allows the light in. Controlling exposure by changing the aperture affects your depth of field—larger aperture (smaller f-stop), means less depth of field. Shutter speed is how long the light strikes the sensor. Controlling exposure by changing the shutter speed affects the way the camera captures motion—a faster shutter speed freezes motion, a longer shutter speed blurs motion. ISO is the sensor’s sensitivity to light. Controlling your exposure by adjusting the ISO affect the digital noise in the image—increasing the ISO to make the sensor more sensitive to light increase’s the resulting image’s noise. Every image you capture uses a combination of these three variables to establish the exposure (amount of light) for every image. And because the variable you choose to adjust affects more than just the exposure of your image, if you can’t justify your choice for each of the three exposure settings for every shot (if it’s not a conscious decision), you have a wonderful opportunity to improve. To illustrate, I’ll explain my exposure choices in the dogwood image above (a new image, captured during my 2016 Yosemite Moonbow and Wildflowers workshop in April). Though I used f/8, 1/125 second, and ISO 1600 to achieve my desired exposure, keep in mind that I could have achieved exactly the same exposure by choosing f16, 1/4 second, and ISO 100. Or f5.6, 1/500, and ISO 6400. Or a virtually unlimited variety of other combinations that all would have captured the same amount of light. But since whatever exposure combination I decide on will potentially yield a completely different image (different depth, different motion, different noise), I had to be very careful with my decisions. f/8: Because the f-stop determines the depth of field for my chosen focal length and focus point, and I try to compose with front-to-back relationships in every frame, f-stop is usually my primary, non-negotiable exposure variable. In this case I wanted my background soft to force my viewers’ eyes to the dogwood only, but not so soft that the background whitewater was unrecognizable. I decided that f/8 gave me the right balance of foreground sharpness and background softness. 1/125 second: When photographing a stationary landscape on a tripod, I can go with whatever shutter speed I need, but when there’s motion in the scene, my shutter speed becomes as important as my f-stop. On this afternoon, in addition to the water moving in the background, I was dealing with a slight breeze. If the breeze hadn’t been a consideration I could have chosen whatever shutter speed gave me the best motion effect, but I needed to freeze the swaying dogwood and was confident I could do that at 1/125 second. ISO 1600: Because it gives me the cleanest images, I always go with ISO 100 when possible, but that wasn’t an option here. Given that I needed f/8 for my desired depth of field, and I wasn’t comfortable keeping my shutter open longer than 1/125 second, ISO was the only remaining variable to control the light in my scene. I spot-metered on the brightest dogwood and increased the ISO until my meter indicated the flower was as bright as I could make it without overexposing. The dynamic range in this scene was great enough that even though the dogwood bloom was fully exposed, the shadows remained quite dark, but fortunately that helps the dogwood stand out. This was my process and rationale for this image. Depending on the factors I’m dealing with, my process might follow a completely different path for another image. F-stop: f/11, because this provides the most depth of field possible at an f/stop that is in most lens’s sharpest range, and without significant diffraction. ISO: 100 (or whatever your camera’s native ISO is), because this is where you’ll get your cleanest (least noise) images. Shutter speed: Adjust until you’ve achieved the proper exposure. These guidelines certainly don’t apply to all situations, but they’re a good starting point that will simplify the decision making process until you get more comfortable juggling your exposure variables. And keep in mind that you’ll need to deviate from f/11 and ISO 100 whenever your creative needs and the scene conditions (such as wind or moving water) dictate. Practice makes perfect. I cover all this stuff in much greater detail in my photo workshops. Regular readers of my blog know of my recent switch from Canon DSLR to Sony mirrorless. I started the transition with the Sony a7R, fully expecting to prefer it over my Canon 5D Mark III enough to justify the switch, but not so much that I’d completely jettison my Canon gear. In addition to 60 percent more resolution than my 5D III, the a7R gave me dynamic range that I never dreamed possible, and significantly better high ISO performance. So, despite a less than trivial adjustment to mirrorless shooting, it didn’t take long to realize that I wasn’t going to miss Canon at all—I haven’t picked up a Canon camera since October. When it became clear that I was with Sony for the long haul, and because I can’t afford to travel without a backup camera, I started thinking about a backup body. My usual backup body strategy is to complement my full-frame primary body with a crop sensor backup body in case I ever want extra reach with any of my lenses. The Sony a6000 seemed the perfect choice—extremely compact (without a lens, the a6000 fits in the hip pocket of my Levis), more than enough resolution (24 megapixels), compatible with all of my Sony lenses, and inexpensive (easily found for under $600). Usually my backup bodies gather dust and only come out in an emergency, or perhaps for the occasional long-distance moonrise (when my foreground subject is far enough away that I want as much telephoto reach as possible). What I wasn’t expecting from the a6000 was primary-body image quality in an extremely compact package—not only does the a6000 have (slightly) more resolution than my 5DIII, its high ISO performance and dynamic range is better than the 5DIII (though not as good as the full-frame Sonys). Given all this, I don’t hesitate using the a6000 when I think I might want a little more reach, often juggling it with the a7R for extra flexibility. Routinely carrying two bodies is certainly not groundbreaking, but it’s new for me. But I wasn’t finished with the a7R and a6000. Given my passion for night photography, it wasn’t long before I added the 12 megapixel Sony a7S to my bag. It took just a couple of night shoots to confirm the raves I’d heard about the a7S’s “magic” ability to see in the dark, but as with the two previous Sony bodies, the a7S proved its value in unexpected ways. More than just a night camera, the high ISO capability of the a7S allows me to freeze daylight motion at twilight and in full shade. I knew I’d appreciate the size and weight savings of a significantly smaller body and (slightly) smaller lenses, but I thought the primary benefit would simply be a smaller bag. And while I do appreciate the option to travel and hike with a more compact, lighter bag without sacrificing the 20-200mm focal range I consider essential, my primary bag has actually gotten a little heavier since I switched to mirrorless. But with that slight increase in weight comes a significant increase in shooting power and flexibility. For my entire photography life I switched lenses as my needs dictated (like pretty much every other SLR photographer). Now, with bodies this small, my bag easily holds three, and rather than switching lenses on one primary body, I first decide which body to use based on the composition (wide or long) and conditions (light and motion). My primary body is the a7R, but when I want extra reach, I don’t hesitate going to the a6000. Sometimes I carry my a7R with a wide lens and my a6000 with a telephoto. And when I need to freeze motion in low light, the a7S is my body of choice. The addition of the a7S to my bag has made the biggest difference, allowing me to shoot in conditions I’d never have considered before. Moonrise above a ridge five miles away? No problem—out comes the a6000 and Tamron 150-600 for 900mm of telephoto reach. Breeze-blown dogwood in a shady forest? No problem—here’s my a7S at 6400 ISO. 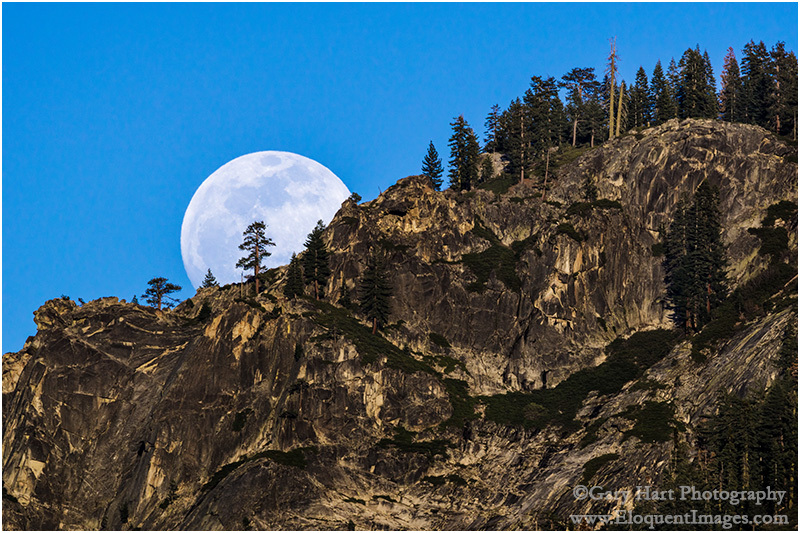 In Yosemite last week I broke out the a6000 and Tamron 150-600 (225-900 full-frame millimeters) for the dogwood, and for a rising full moon. The a7S was my moonlight camera, and just what the doctor ordered when I wanted to photograph wind swaying dogwood in full shade. 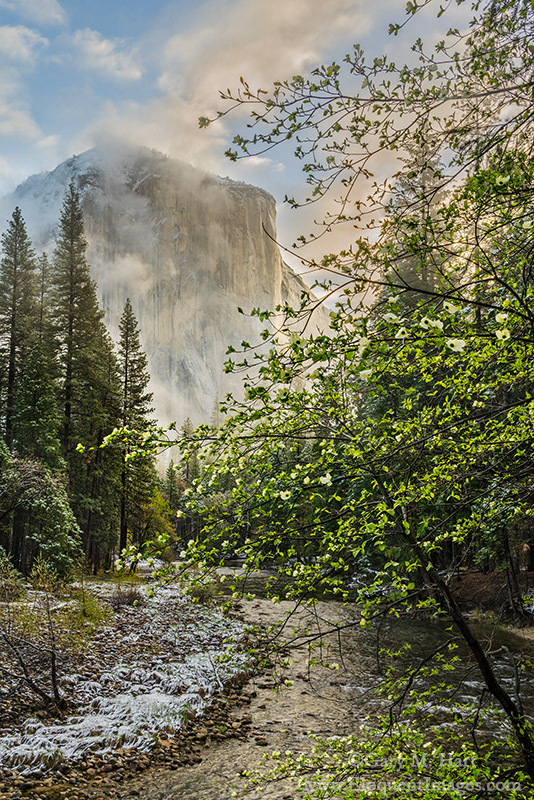 On our final morning I guided my workshop group to Valley View to photograph the first light on El Capitan. Beautiful as that scene is, it wasn’t long before a few drifted across the road to an evergreen forest sprinkled with blooming dogwood. A breeze, further augmented by speeding vehicles, limited everyone else to distant views and brightly backlit flowers. I, on the other hand, simply switched to the a7S and bumped my ISO to 6400 to enable a fast enough shutter speed for extreme close photography. With my 16-35 lens at 16mm, I put the front element about three inches from a bloom in full shade, dialing to f8 to ensure enough depth of field to keep my flower sharp throughout. Even in the dense shade, I was able to achieve a shutter speed fast enough to freeze the breeze. Noise at 6400 ISO? What do you think? I don’t fish. But then, Norman Maclean’s words really aren’t about fishing anyway. I’m reminded of his quote every time I see photographers frozen by minutia, mired in the moment by small distractions that matter very little on the path to their grand objectives (better pictures): There’s dust on my sensor, this lens is soft, the light was better yesterday, it’s too cold, it’s too hot, it’s too wet, and so on. Near the top of photographers’ list of self-imposed obstacles seems to be an insecurity about their gear. Instead of doing what photographers do (photograph), many spend far too much time reading reviews, scouring specifications, checking prices, and abusing photography forums. Whether their goal is to rationalize the merit of their current equipment, or to justify the expense of a new one, all this makes me wonder how much they enjoy the actual act of photography. A related behavior I’ve observed since my switch from a Canon SLR system to a Sony mirrorless system is an irrational obsession with the photo equipment of other photographers (for example, mine). I’m always happy to answer questions about my photo gear (okay, almost always), but I’ve detected an underlying tone of insecurity in some (not all) of the queries, as if my camera choice somehow invalidates theirs. Some have wanted reassurance that their camera is still okay (it is), and others have actually tried to “suggest” that I’ve made a mistake (I haven’t). I know I haven’t made a mistake because my needs are my own, I’m quite happy with my new gear, and I’m getting pictures I couldn’t have gotten before. End of debate. And for those who fear that my choice means their camera may be less than perfect, let me just say that there are many good reasons to get a new camera, to replace an entire system even, but seeing another photographer do it is not one of them. If you have a working DSLR of pretty much any vintage, you can get usable captures. To illustrate this point in my workshops and training, I sometimes go all the way back to 2003 and my Canon 10D, my first DSLR. Shooting with my 10D today, I’d probably be crazy-frustrated with the 6 megapixel, 1.6 crop sensor, it’s postage-stamp LCD, poor low-light performance, and limited dynamic range—but that doesn’t change the fact that I got great images from that now ancient beast, images that I’ve enlarged and sold (in person, to people who could walk right up and scrutinize each pixel) prints up to 24×36. Images that people still buy. In other words, if the images I got from that camera are still usable, there’s no reason 10D images, or whatever ancient camera that might serve as your flagship capture device, clicked today wouldn’t be usable. So how long should you wait before replacing your camera? That’s an individual decision based on many personal factors. My general recommendation is to hold off on a new camera until you’ve upgraded all your primary glass (the lenses you might use on any shoot) and your support system (tripod and head) to the best possible. These things will serve you far longer than whatever the latest and greatest camera might be, and really, the longer you can put off that new camera purchase, the better the technology will be when you’re finally ready to do it. That doesn’t mean there won’t be temptations. For example, like an ex-girlfriend trying to lure me back with triple-D implants, Canon has announced a 50 megapixel sensor. Yikes. But if she really understood me, was in tune with my deepest desires, she’d have known I wouldn’t be impressed, not even a little. It’ll be interesting to see how the other manufacturers respond to Canon’s move. I’m okay standing on the sidelines of a megapixel war as long as manufacturers understand that most serious photographers prefer sensors that emphasize pixel quality over quantity. Once you have all your lens and support ducks in a row, maybe it’s time to think about upgrading your body. Maybe. Start by asking yourself what’s important to you. The Canon 5D Mark III filled most of the basic camera criteria for me: full frame, 100 percent viewfinder, (decent) weather sealing, functional live-view (much better than the 1DS Mark III it replaced in my bag), and multiple card slots (miss that in my Sony a7R). I ignore many oft-touted features that are important to others but mean little to me, such as: resolution, autofocus, video, in-body image stabilization, and touch-screen LCD. I guess the point is that buying a new camera is never an emergency (unless you don’t have a camera). Take your time, set your budget, and be honest with yourself about what you need (and don’t need). In the meantime, get off the computer, grab whatever camera you have, and get out there and shoot—you can’t land fish without putting a line in the water, and you can’t take pictures without putting the world in your viewfinder.